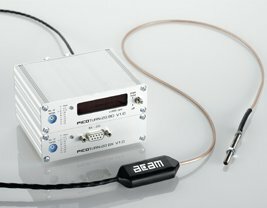 PICOTURN-2G represents the second generation of ams (previously acam) well established system to measure the rotational speed of turbochargers compressor wheels. As a fully integrated and compact solution the PICOTURN-2G is a miniaturized sensor system that perfectly suits to applications in the engine bay. PICOTURN-2G represents the second generation of the well established system to measure the rotational speed of turbochargers compressor wheels. As a fully integrated and compact solution the PICOTURN-2G is a miniaturized sensor system that perfectly suits to applications in the engine bay. The sensors are IP 67 proof and provide a standard TTL / CMOS output signal, whereas each edge corresponds to one vane of the compressor wheel. The open system architecture and the modular system design allows an easy integration into existing measurement systems as a stand-alone solution or optionally with the ams (previously acam) PT2G-BX or PT2G-BD signal conditioning boxes. The sensor is made of a simple coil with a ferrite core. Together with a resistor this forms an R-L network, the time constant of which is measured by a TDC. Placing a vane of the compressor wheel in front of the coil will change the time constant of the R-L network by the appearance of eddy currents. A DSP-unit following the TDC measurement unit processes the time data and calculates the rotational speed. The time measurement is done with very high precision. The resolution is about 125 ps. The time constant of the R-L network can be very small, allowing high sampling rates in the range of 1 to 3 million samples per second. The effect of eddy current damping is best for paramagnetic materials. This method therefore is very good for detecting aluminum wheels. The maximum distance of the sensor from the wheel depends on the shape of the vanes. It varies from 0.8 mm (32 mm wheels) to 1.6 mm than 1 mm (90 mm wheels). Thanks to the ratio measurement any trimming of the coils is not necessary. The length of the cable between sensor and circuit may be up to several meters. This allows to separate the electronics part from the sensing part, reducing thermal and vibrational influences on the electronics. The special kind of measurement reduces the influence of changes in the dielectric constant (e.g. by dirt) to a minimum. To download any documentation or datasheets, please fill in this form to access our downloads page. Thank you.